More than 1.6 million juniors in about 22,000 high schools entered the 2019 National Merit Scholarship Program by taking the 2017 Preliminary SAT/National Merit Scholarship Qualifying Test (PSAT/NMSQT), which served as an initial screen of program entrants. 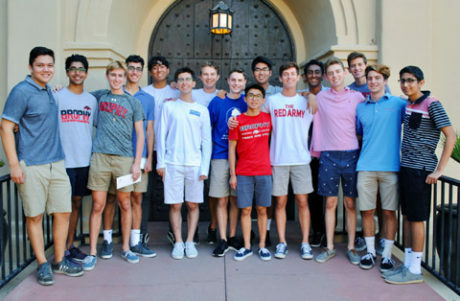 Brophy seniors who earned recognition as National Merit Scholarship Semifinalists for 2019 are John (Jack) Callahan, Ryan Chaffee, Bryan Gopal, Bryce Grove, Connor Hill, Rohit Khurana, Paul Kim, Nikolas Kirk, Eric Lin, Justin Loo, Cameron MacKenzie, Jacob Michalik, Alex Noori, Ayaan Patel, Nicholas Rau and John Schantz (submitted photo). The nationwide pool of Semifinalists, representing less than 1 percent of U.S. high school seniors, includes the highest-scoring entrants in each state—and several North Central students made the list this year. Semifinalists from Sunnyslope High School include: Jeremy Becker, Zoe Friese, Derek Gemar, McKenna Kellner, and Michael Perry. Danielle Zylstra from Thunderbird High School also was named a semifinalist. In addition, 16 seniors at Brophy College Preparatory were named National Merit Scholarship Semifinalists. Among them are North Central residents Cameron MacKenzie, Jack Callahan, Johnny Schantz and Nikolas Kirk.